You would be forgiven for thinking that the above title makes no sense at all and that a project should be done using one system or the other but not a mix of both. 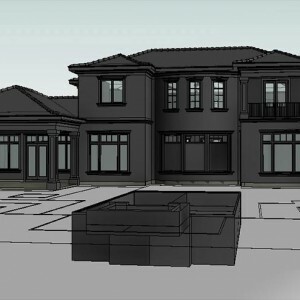 What is the point of building a Revit model of a building but using CAD for certain elements of it? This question would be completely understandable and hard to argue if the Revit model was going to be further developed into a full BIM model. However when it comes to architectural visualisation, budgets and timeframes, sometimes a little bit of CAD is just what the doctor ordered. 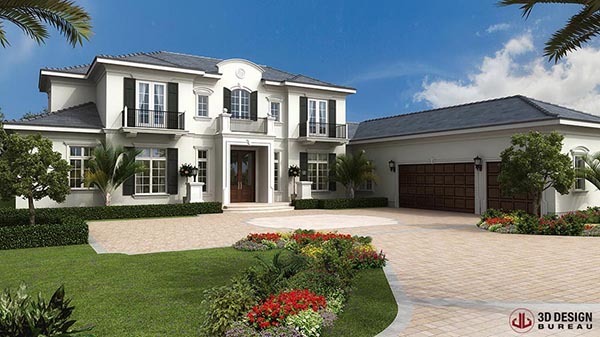 The project in question was the production of two photorealistic architectural renderings of the proposed private luxury development in Florida. The purpose of the 3D renders was for presentation and marketing. 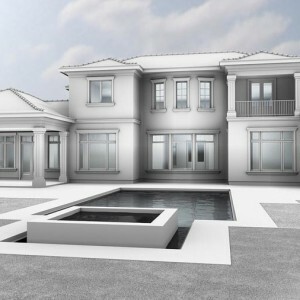 The work involved the complete 3D modelling and 3D visualisation of the entire exterior of the house with a request for one front view and one rear view of the luxury home. The workscope also included detailed 3D modelling of the proposed site layout and illustration of the extensive hard and soft landscaping. Both 3D images were required at high resolution to the usual high standard that our client has come to expect on such projects. 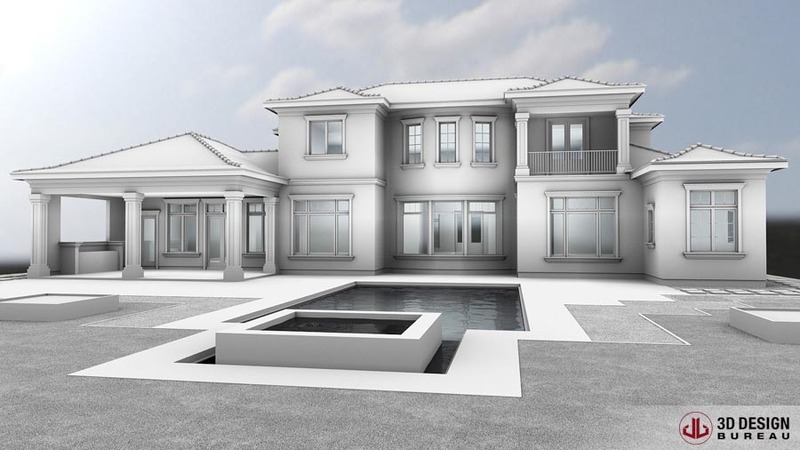 On all previous projects for this particular client, we have 3D modelled their luxury home designs solely using CAD. However due to changing workflows within our 3D studio, we identified this project as the perfect opportunity to create the 3D model using Revit allowing us to compare workflows and modelling times. Our intention at the outset of the project was to 3D model the entire house, along with the proposed site and landscaping layout in Revit. However we were also conscious of time and associated costs and we did not want the project to overrun. We had a full set of 2D CAD drawings from which to work from which meant leaning on our CAD to BIM service. However the scope did not require the production of a BIM model and this would have involved considerably more time to create. From an initial project meeting, which we hold before any project commences, it was agreed that we were going to model the house for 3D visualisation purposes only. This was a very important decision as it cut down on workloads as all interior spaces of the house did not require modelling due to the fact that they would not been seen in either of the 3D renders. Also all building components did not require proper construction makeup – what you can’t see in the image does not require modelling. Modelling in Revit for 3D visualisation purposes is different than modelling in Revit for BIM purposes. ie no need for excess modelling. The initial modelling phase started out well and as expected in terms of time and workflows. Bespoke families were created for elements of the building such as the windows, doors and shutters. 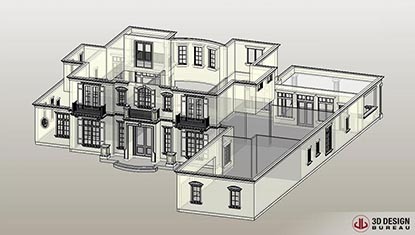 The windows took longer than expected as each window in the home is different and therefore each one needed to be created as a new Revit family. It was when we arrived at modelling the roof of the house that the decision to revert to CAD was tabled. 1) The roof was not a straight pitch and contains a change in pitch towards the bottom of it, therefore complicating the modelling process. 2) Time frame and costs. Whilst modelling the roof was achievable in Revit, the time it would take would exceed the modelling of it using CAD. Due to timeframes allocated to the project, the deadline and subsequent associated fees, the significant difference in modelling time for the roof, justified the decision to model the roof in CAD. 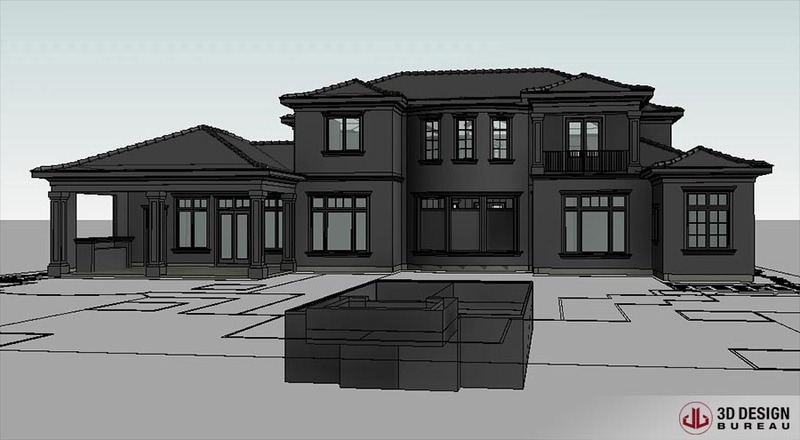 Another factor for us was that our other Revit resources were taken up on other projects and because our modelling workflows have not fully switched over to Revit yet, it made sense to collaborate between CAD and Revit. At first there were one or two questions over the workability of such collaboration. One in particular was raised – would the time saved modelling in CAD be negated by the time taken to combine both models for handover to our 3D artist? We were pleasantly surprised at the seamless integration of both 3D models which caused no problems whatsoever. In truth, a lot of this came down to work practices we have previously setup with Revit when modelling for BIM visualisation purposes, in particular naming conventions. Having proper naming conventions for our 3D artists to work off, when dealing with a Revit model, is imperative and saves a lot of time on the 3D visualisation side of a project (texturing, lighting etc). > Modelling time in Revit approximately the same as CAD for such a project due to bespoke elements and very little repetitive families. > More complicated structures such as the roof are quicker to model in CAD but we expect this to change as workflows are fully switched. > Collaboration between CAD & Revit a success and will be used on future projects where necessary and when resources may be scarce for Revit modelling and the project allows for it. > Revit will be ideal for visualisation projects of large apartment, commercial buildings with repetitive floor designs and families.